Back to School Routine, Munch did Not Cope Well. 27 Apr 2011 Comments Off on Back to School Routine, Munch did Not Cope Well. This morning started off well enough, Munch got up in a good mood, he tried to say that he was feeling sick, but mummy knew better, especially as he ate all his breakfast. Munch was happily writing at the table and got ready for school no problem at all. After school was a different matter though, whether it was the fact that we have had a very odd few weeks and then going back into the routine of school I don’t know but when we got in we started his reading, he was very unco-operative, he was missing words, reading in gibberish, pretending not to know words that I know he know’s very well. So I just shut his book and said that if that was the mood he was in there was no point in carrying on and I would just write in his book just that, start of the pleading, ‘no mummy, I will read’, so second chance given, no change, so I stopped. Munch now started pushing and getting aggressive so it was – Step, he was pushing and trying to bite me so I just took him to the step and tried to put me and the dog into the living room out off his way, he dived into he living room and when I told him to go back to the step, he said no, I just manoeuvred him to the step and said his 7 minutes would start when he was on the step. I had to stand with my back to the door, he eventually got the message and went and sat on the step and did his time. After his time up, he did wanted to read and did finnish his reading, if not as well as I know he can, as well as could be expected given his mood. I do write how he has read in the book though, and did say to start he had been uncooperative. His mood continued he was being very contrary, wanting, then not wanting, jus being very whinny and trying to control situations all evening, I had ordered new ice boots for him as his one I had bought were to big and wanted him to try them on, he put on a big show of not being able to get them on, whilst making no effort, I was not being drawn in, so just said to leave it for now, and as we were putting them down, he accused me of strangling him, in a very aggressive tone, so he know’s this is wrong and was sent to the step, he immediately tried to change not what he had said but how he had ment it, but blaming people for things means the step, so step it was. After his second sit on the step Munch seemed to have calmed a little, he tried on his ice boots, and then went to watch TV, which he did quietly until dinner. A dinner we had an incident where he knocked some of his food on to the table, you would have thought he had lost the lot by the way he carried on, he wailed, he wasn’t eating anymore, stropped away from the table, a complete over reaction, I just talked very calmly and we put the food back onto his plate,took off his cloths as they had gravy on and we managed to finish dinner in a civilized way!! Munch went back to watching TV whilst I got his karate gear ready, I spoke to him whilst he was watching Tv, and again he shouted aggressively that he was watching TV, so he got sent to the step again as he is not allowed to talk to people like that, and just writing this down has made me remember, that the one thing our play therapist had us doing when things were bad and it worked quickly was – your being rude with your voice – that’s not allowed – STEP, and your being something with your body – that’s not allowed – STEP. Can’t remember the wording we used so will have to get out my note-book and look it up and go back to it as it worked a treat before, and we have found that it is better to get on top of this behaviour then let it take hold and get out of hand which it can quite quickly. After that karate went well, home and his usual TV before bed, story and he asked for snuggle time and cream time tonight, so 5 minutes before lights out we did snuggle time which consisted of doing This Little Piggy, and Round and Round the Garden so a bit of regression needed tonight, then a lovely massage with his special cream, so nice and tactile. One thing that I have not mentioned for a while is that we still have the constant calling down each night for a good 1-2 hours, tonight it was only for 1/2 hour, so maybe the nice relaxing massage helped just before light out, so will try this again. This morning Munch came into us at 8am and asked if he could put his X Box on, we said as it was not a school morning he could, 1/2 later he came and asked if he coud put a DVD on using his X Box, yes said we. At 9am daddy got up and very kindly said for me to have a lay in and he would deal with Munch, after Munch jumping on the bed several times and the dog doing her bit as well 30 minutes later I gave up and went down. After Munch having been our very own little star yesterday, today he was full of attitude, 4 times he ended up on the step, for shouting at us, demanding things, and generally trying to control. We knew we needed to do the step before things got to much, we have learnt that we need to get on top before he does. It seemed to do the trick and calmed Munch down. Me and Munch played a couple of his games he had received yesterday, then Munch and Daddy took his big Ford Truck over to the side road across the road as it is very quiet and has a large area at the end, I was just settling down with a coffee and the computer when back they came the battery needed charging again, it must have lasted a whole 40 minutes in total, so back on for another 8 hours of charging. Daddy said Munch had been very good and had not even made a fuss when he had crashed it into the wall. Back at home, Munch went around recording what me and daddy were saying on his spy pen, he played with the garage and cars for a while before going on the computer to play his recordings off his spy pen. He stayed on there for a bit and after lunch Munch decided to watch the 1st film from his Trilogy of Spy Kid film’s. He is now upstairs on the landing with all the empty box’s from yesterday, his Spy Recording Pen and some binoculars. I am going to make the most of it and make a coffee and put my feet up and watch some TV that I want to watch for a moment. Well Munch was upstairs for almost 2 hours in the end, and what was he doing, making things with the box’s!!!! We put on Charlie and the Chocolate Factory which I have to say Munch watched and I dozed through, towards the end, I woke up and felt very sick and was very sick!!! Don’t know what that was about and I have been fine since. We had dinner, then bath and downstairs just as daddy came in from work, Munch was very excited to see him and wanted to have a game of Junior Monopoly instead of TV, so we all started to play, we put a 1/2 hour limit on the game as it was getting on, all was going well, we were having a very merry time, Munch was being very funny and all 3 of us were having a good laugh when Munch didn’t get the number he wanted on the dice, so he shouted and cried and hit daddy on the head, he was told it was not allowed and step, which set him off even more, as he would not go to the step, we said that the game was being put away and he still had to do his time on the step and I took him by the arm and lead him to the step, which just made him hit out and kick at me, normally I would send him up to his room for a longer period, but as it was almost bedtime I continued with the step, told him very firmly that the behaviour is not allowed and he sat and did his 7 minutes. Step time finished and it was supper and bed, he was back to being a happy chappy, and went to be with any fuse. Another good day, a couple of very minor incidents compared to what we used to get and we are thankful for how far we have come with our wonderful son. The day started of well, the play therapist came and her thing, I could hear them in the living room and thing’s seemed a lot calmer than they had been the week before, when finished daddy took Munch to school and we had our usual catch up, this week we talked a lot about helping him to manage things. I picked Munch up from school and we went straight to our local shopping centre where they were having the grand switching on of the christmas lights. This was something out of the norm for Munch and when we arrived he found it very difficult to cope with, he did his usual thing when he feels out of control, he wanted to go home, then he didn’t, we were going to eat he didn’t want to then he did, he moaned about the restaurants, so I took control and told him that if he was unable to cope we would go home we would not spend all evening with him being as awkward as he could, so I just said to the car now, and marched him back to the car, all the way protested that he didn’t want to go home, I did not respond, I just kep going until we got to the car, opened the door and told him to get in, once he was in, I spoke to him and said that his behaviour that he had been displaying was not allowed and he could decide now whether he wanted to carry on or if he could stop we would go and see the lights, if he decided to stay, if I had to speak to him once more we would go straight home no second chance, he chose to stay, and I think this help him to regulate himself as we had a couple of little moans, but nothing major. We went to Frankie and Benny’s to eat Munch’s choice, read him the kids menu, don’t know why really as he chose the Spag bol, he always does. Once we had eaten we went to the market square where the events were happening, we had a look around the few stalls, Munch wanted a Santa Claus hat which he wore with pride all night, I said that he could choose something of the toy stall and he chose a mini pool table. We then went to watch what was happening on the stage, we watched some dancer’s, then Hagrid, Dumbldore and Harry Potter made an appearance, Munch was enjoying this until the sound went and he got bored so another walk around the stalls, he had a ride on one of the little ride’s, but I think after riding of the rides he went on a Chessington that Ithink he found them a bit tame. We bought some sweets to eat on the way back to the stage, there was a couple of singer’s, so we had a bit of a dance and sing along, hen Santa, Rudolf and Jack Frost came along and did a bit on stage, towards the end of their bit I think MUnch was getting a bit bored and asked if we could go, but as thee was only about 5 or 10 minutes until the switch on I said we should stay, we joined in the big count down and on came the few light bulbs, there was a lovely firework display which Munch enjoyed, then it was back with the crowds to the car, As we were walking back and we were looking at the lights Munch said “see mummy, I told you they were going o be rubbish” and he wasn’t far of the mark. Once home Munch wanted to play a game of pool whilst having his supper which we did, the pool game was absolute market rubbish, but Munch really enjoyed it so that was the main thing. Game went on till after bedtime, so straight up, teeth and bed, we had a hug and kiss good-night, when kissing Munch, I smothered his face all over and kept going, he was really giggling, when we said good nigh he said “that was great fun”. 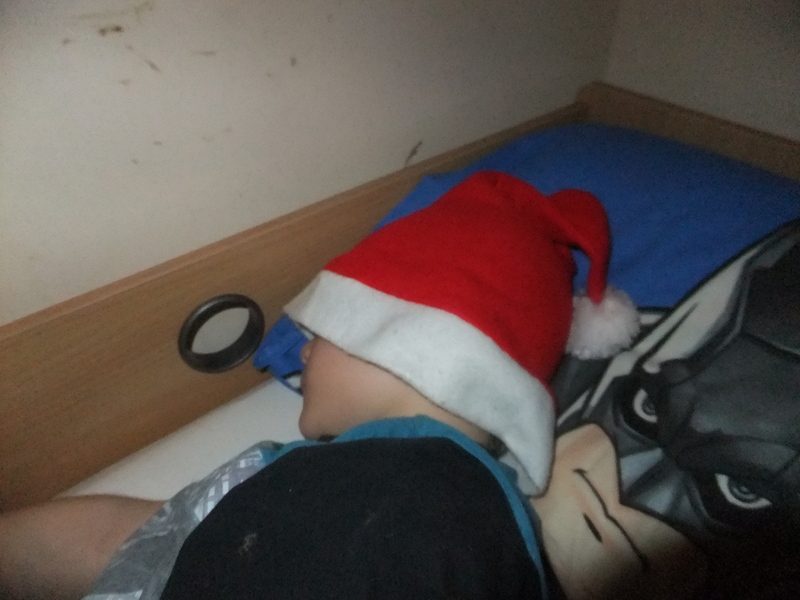 Later on when I looked in on him, Munch was fast asleep wearing his Claus hat, looking even cuter, if that’s possible, than ever. This morning Munch was still asleep when I go up so I left him in bed for a while. The morning was very pleasant and we got to school all in good spirits. After school we once home we did Munch’s reading, he was not in a cooperative mood, so I told him to read it as he wanted to and that I would just write in the book how he had read, he was mumbling his words, saying them very quietly, missing out whole lines and making out he was unable to read some words that I know he know’s, I just did not rise to it and told him again what I was going to write, half way through, he gave up and read well, no point not reading well when it is not getting you the attention he wants. I wrote what I said I was going to in his book, which will be a good deterrent in future as he does not like to look bad at school. Reading finished we did some subtraction’s which he did well and some spelling’s which I myself have decided to start doing with him as his spelling is appalling and I feel that he needs help, so I am going to start off with 5 words a week and see how we go. Once all that was out-of-the-way we did Munch’s special time play, this is where we play what Munch wants to do, and I do what he wants, he is totally in control, the theory is if we give him this time of control, he will feel less like he has to try to take control at other times. I had on the request of the play therapist I had bought Munch a tube of Lego today to add to his already very large collection of Lego, Munch had spotted this so wanted to play with it, I took my lead from him and built what he asked me to, whilst building himself, he kept getting very annoyed with himself when things were not going as he wanted them to, he started hitting himself and saying he was an idiot, I kept saying to him he was doing really well, that the good thing about Lego was that if it was not right you can change it and build it stronger, we had a few episode, but with lots of reassurance he got through them, they were all direct at himself. When we had finished he carried on playing with the Lego on his own. Tea, bath, and bedtime routine went well, I sat on Munch’s bed and he cuddled in whilst having his story and he asked for 5 minutes snuggle time afterwards which I gladly did, we did our cream after that, lots of massaging in his cream, lovely hug and kisses, wow, lots of positive touch this evening, and one happy mummy.